Just as a reminder, if you know you will be changing e-mail addresses and still want to continue receiving this monthly Bassett newsletter, please let me know your old e-mail address and your new e-mail address. I had more than 30 returned e-mail this past month when sending out the May issue of the newsletter. Many thanks this month to Pat Newton and Glenda Lather who have added several thousand new Bassetts from my files into the database at our website. I also want to thank Kathryn Bassett for her time as well. She serves as our webmaster. Most Aledo people have been familiar with the fact that Victor H. Bassett, son of Attorney I.N. Bassett, has been pursuing a course of study in Johns Hopkins University medical school of Baltimore, Maryland, one of the best medical schools in America. His many friends here are happy to note that he has recently achieved fame in the medical world by the discovery of the germ which causes cholera infantum among children the fact being announced in the Chicago Chronicle of Tuesday. Mr. Bassett had been making a special study of children's diseases during the summer at the Thomas Wilson sanitarium for children at Baltimore, an institution which cares for from 300 to 400 children at a time. The supposition among medical men has been that there was a distinctive germ which caused the disease but the germ had not heretofore been discovered. Mr. Bassett and a fellow student, Charles W. Duvall, had been devoting especial attention in the direction of the discovery at the sanitarium this summer and their efforts were finally crowned with success. Full credit is freely given to Mr. Bassett, for the discovery of the germ while to his colaborer, Mr. Duvall, is given the honor of its isolation. Both students had been selected for the investigation work on account of their great aptitude, and after they reported their discovery the matter was taken up by Dr. Welsh and Dr. Knox of the sanitarium and fully verified by them before the announcement was made public. Work of this kind is watched by medical men all over the world and it is a great honor for anyone to have discovered the distinctive germ of any disease and is not ordinarily accomplished by undergraduate students. Mr. Bassett, however, is perhaps as well qualified as anyone could be to do this kind of work. He has always been a deep student of nature in all her forms and for some years prior to his entering Johns Hopkins he had been a student and later an instructor in biology in the University of Wisconsin at Madison. Prior to that he had shown himself to be one of the brightest students that ever went out from his city or county. His friends here are happy to hear of his new honors. He has recently been offered the position of assistant professor of pathology in the medical department of the University of Chicago but it is not know that he will accept. Jacob Hornbeck Bassett is a son of James S. Bassett of New Jersey and Pennsylvania. He moved to California and built Bassetts Station. James S. Bassett was born about 1804 in New Jersey. He married (1) Maria Hornbeck. (HSWC) He married (2) Sarah Cushman, daughter of Rufus and Lucy (Griswell) Cushman, on 31 Jan 1850. she was born 18 Oct 1804 in Pomfret, Vermont. J.S. Bassett was listed as president and treasurer of the Honesdale School Board in January, 1843. From History of Hawley, Pennsylvania, we have "About this time the first post office was opened (1837) with James S. Bassett as the postmaster, and the office was officially knowns as Paupack Eddy, Pennsylvania. This office was located on the east side of the Lackawaxen River and was, a few years later, removed to the west side of the river, when Orrin Hall became postmaster and moved the office into his store, which was located in the residence now owned by W.B. Ammerman." Where Howard Creek runs through the Sierra Mountain range, settled worked the land surrounding it called Howard Ranch. In 1871 Jacob and Mary Helen Hagerty Bassett bought Howard Ranch and built what was then known as Bassett House. Bassett House was a teamster stop for freight wagons so they could feed and water the horses on their way between Loyalton, Sierraville, Sattley, Sierra City and Downieville. On the same land was a sawmill operated by the Philip Hayes family. The logs were hauled to the mill by a team of oxen generally numbered to be 10 in the team. Jacob and Mary came to California from Pennsylvania looking for gold and ended up on Sierra County in the early 1860's and remaining there until their deaths. Jacob worked for the Sierra Buttes Mine as a ditch/water tender. Mary operated Bassett House with the help of a Chinese cook once the house was built. Bassett House was a two story wood structure with a lobby, dining room and kitchen downstairs. The remaining living quarters were upstairs. The house catered to full time sawmill workers as well as overnight miners passing through the area in their search for gold or better times. In the lobby of the original house stood a barrel in the corner full of whiskey. When someone was "just a little thirsty", they would saunter over, fill their cup to the brim and then pay for the privilege of drinking the whiskey. If you didn't have your own cup, you didn't get the whiskey. The price of a cup of whiskey was about twenty cents. Bassett House was built and moved four times. The original house stood on Howard Ranch on the north side of the road, it was then torn down and moved across the street in the 1930's. Then it was again torn down, and moved back to it's original spot. The final move came in 1962 where Bassett Station now stands with the motel built prior to the store. 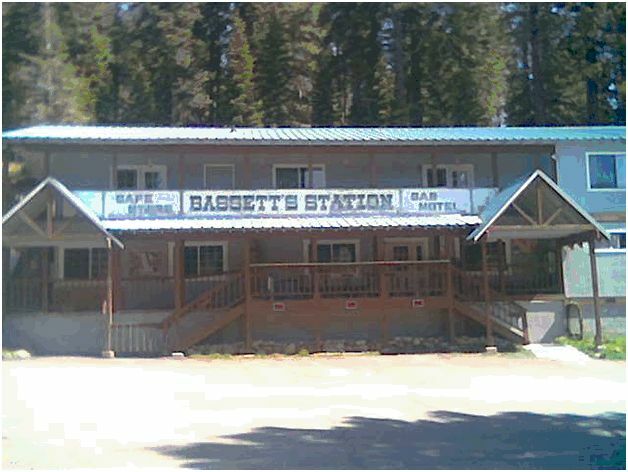 The current Bassett Lodge has a complete listing of all owners beginning with Jacob and Mary Bassett. The Bassett children were raised at Bassett House. There were four daughters and one son. The daughters were Alice who later married Phillip Hayes, Mary Helen (Mollie) who married Sam Lusk, Hattie who married Bob Babb, and Maud who married Herbert Hinkley. Their only son, John Bassett, who went deaf at the age of seven (7), never married, and was a game warden and mail carrier in the area until his death by train while walking on the railroad tracks. The Bassett sold Bassett House in the early 1900's taking it out of the original family's hands for the first time in over thirty years. Sam Lusk and Mary Helen (Molly) Bassett met and married on May 5, 1887 in Nevada City. They acquired Bassett House in 1900 and operated it until 1901. During the time the Lusk's operated Bassett House, Molly kept a daily log which is still in the family. On May 18, 1900, breakfast and dinner were 50 cents; supper was $1.00, to board 2 horses for overnight and haw was $1.00, dinner by itself was 23 cents. On June 6, 1900 Molly sold eggs for 25 cents a dozen, and a long time customer, Pete Debernardi paid 75 cents for dinner, supper and bed. On August 22, 1900 they paid $1.00 for a bottle of whiskey and November 29, 1900 a bottle of sherry was purchased for 25 cents. That same year in November, Sam and Molly bought 500 pounds of flour for $11.75, 500 pounds of potatoes for $6.25, and two boxes of apples for $2.50. On November 11 they paid $6.60 for freight and November 12, 1900 the Lusk's paid $10.10 for taxes on Bassett House. During the time Sam and Molly Lusk operated Bassett House, Sam homesteaded 160 acres near Salmon Lakes now known as Lusk Meadows. Sam ranched Lusk Meadows and used it as summer pasture for livestock. The cattle were housed on the American River near Folsom Prison during the winter. Sam subdivided the meadow in 1912. That section separated from Lusk Meadows became known at the Diamond "L" Resort. There were 17 lots for summer cabins, six of them had cabins which were sold to individuals, and a few others had cabins for rent. Some lots were never built on. The lots were 105' by 60'. The remainder of Lusk meadows, one hundred and forty acres was sold to the Farrell's after Sam Lusk died. Around 1884, prior to Sam and Molly's marriage, Sam Lusk drove stage from Downieville to Nevada City. This was about a 12 hour trip, six days a week with Sunday off. Sam changed horses at Mountain House, Camptonville, and North San Juan ending the trip in Nevada City. The teams consisted of 4 horses per team and during the snowy winter, changed to a sleigh. The horses had to wear snowshoes which were 12" x 12" metal plates, with the horses foot fitting into holes sculpted into the metal that fit the hoof. There was rubber belting between the metal and horses hoof to keep them from freezing to the metal. During World War I, Sam was a guard at the Penryn Tunnel. There were 2 guards, one of each end so it could not be sabotaged by the enemy. From there, Sam went on to work as a guard at Folsom Prison, and then worked as a camp guard while the prisoners were building Highway 49 in 1922/23. Sam then moved to Goodyears Bar in 1923, operating a small store and gas station and renting out cabins to tourists and fishermen. The business sold in 1935 and Sam retired in Goodyear's Bar until his death on Thanksgiving day in 1936. Sam and Molly Lusk had four sons all raised in the Sierra Mountain range. The fours boys were Marion Lusk, Howard Lusk (named after Howard Creek at Bassett House), Seton Lusk who died at the age of 11 and the youngest, Barney Lusk who now resides in the North San Juan area where his father used to stop and change horses. 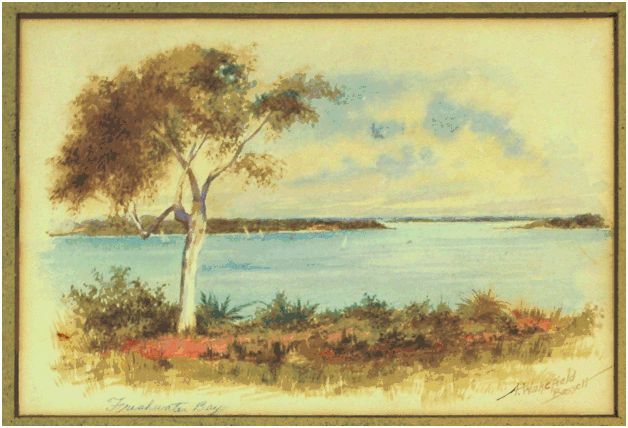 To read more about Bassetts Station, click on the link below. Two DNA (matching) results are back for descendants of #234B Richard Bassett of North Hill, Cornwall. Both of these participants descend through son John Bassett and wife Ann Sleep. They do not closely match any other Bassetts in the Bassett database. To verify the DNA of Richard Bassett, father of John Bassett, we would need to find a male Bassett descended from William Bassett and wife Elizabeth Vosper to take part in the project as well. Below are the 25 marker results for the two male Bassetts descended through John Bassett and wife Ann Sleep. Richard Bassett was christened in 1767. He died Dec 1814 in North Hill, Cornwall. He was buried 17 Dec 1814 in North Hill, Cornwall, aged 47 years. He married Jane Harris on 15 Mar 1798 in North Hill, Cornwall. She was christened in 1776. She died Jun 1852 in North Hill, Cornwall. She was buried 3 Jun 1852 in North Hill, Cornwall, aged 76 years. She married (2) Richard Sleep on 16 May 1826 in North Hill, Cornwall. Richard was a widower and Jane was a widow at the time. 234B1. Mary Bassett - christened 15 Jul 1798, married Richard Forster on 18 Sep 1821 in North Hill, Cornwall, England. + 234B2. William Bassett - christened 20 Sep 1801, died 8 Jan 1859 in Bassett Town, South Australia, married Elizabeth Vosper on 13 Oct 1829 in North Hill, Cornwall, England. 234B3. Anne Bassett - christened 16 Jun 1805, married John Stephens on 17 Apr 1823 in North Hill, Cornwall, England. + 234B4. 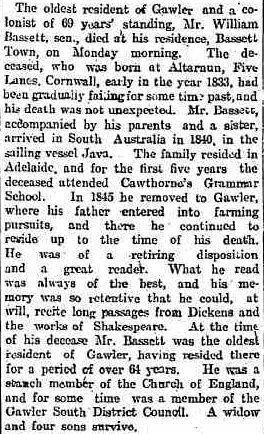 John Bassett - christened 13 Dec 1807, died Apr 1890, married Ann Sleep. 234B5. Samuel Bassett - christened 24 Feb 1811, died Jan 1815. 234B6. Jane Bassett - christened 14 Feb 1813, married Samuel Doney on 17 Feb 1855. 234B7. Elizabeth Bassett - christened 12 Nov 1815. 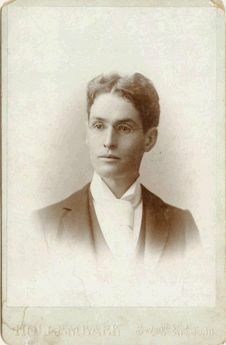 Edward Bassett (b. 1809) and wife Clara J.
Abbot Bassett, for thirty-seven years a resident of Newtonville, died at his home on Central avenue, on Monday, November 24th. He was born in Chelsea, March 10, 1845, and was a member of the first class to be graduated from the Williams School. He entered the Chelsea High School but left before the end of the first year to enter the hardware business. In 1872 he started a weekly paper “The Chelsea Public,” and continued in newspaper work until 1887. His connection with bicycling interests began when he became business manager of the “Bicycling World.” In 1886 he started a paper of his own called “The Cycle”, which was devoted to the news of the sport. In 1887 he accepted the position of Secretary of the League of American Wheelmen which was organized in 1880, and he held that position up to the time of his death. The secretary-ship carried with it he editorship of the League’s official organ known as the “Official Bulletin” which was published until a year ago when failing health obliged Mr. Bassett to stop the paper. 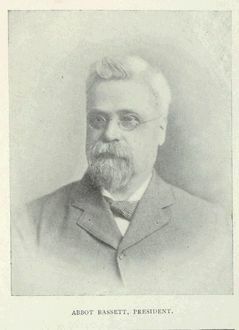 He moved to Newtonville in 1887 and was a member of the Newton School Committee from 1901 to 1911. He was always interested in civic affairs though not identified with any clubs except the Every Saturday Club of which he was once president. He married in 1873 Helen E. Drew of Chelsea who survives him. In 1923 they celebrated their golden wedding. There are also two daughters, Marion Drew Bassett and Mrs. Royal T. Lapham, also of Newtonville. Funeral services conducted by Rev. Paul S. Phalen of the West Newton Unitarian Church were held at the home on Wednesday, November 26th and the body was cremated at Mt. Auburn. 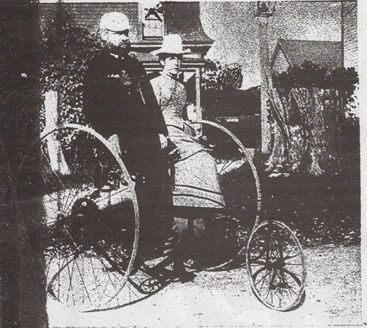 The first American tricycle century was made by Mr. Abbot Bassett, of The World, September 29. Starting at 4 A.M. from his home in Chelsea, he ran by way of Malden, Medford, Somerville, Cambridge, and the Newtons, to Natick. Returning by the same route to Malden, he continued his course through Saugus, Lynn, Beverly, Wenham, and Hamilton, to Ipswich. Then from Ipswich to Chelsea, over the same route. Two cyclometers were used, a McDonnell and Stanton’s. The former registered 106 and the latter 104 ½ miles. The latter distance is the record to be allowed. Mr. Bassett was accompanied the first 50 miles by Mr. Frank M. Gilley, of Chelsea, on a bicycle, and this part of the journey was measured by 3 cyclometers, which agreed, with but a trifling variation. The course is certified by hotel registers and certificates. Thorndike Bicycle Club of Beverly, Mass. No new kits mailed and no kits returned to the lab this month. Several upgrades by different project members were ordered.